Recover Passwords - Simple tool to recover passwords from installed major software products. Simple tool to recover passwords from installed major software products. It will retrieve passwords from more than 100 installed software programs, including such popular programs as Microsoft Outlook, Mozilla Firefox, MSN Messenger, etc. You will be able to scan multiple remote computers at the same time without installing anything on remote PC. The program is easy to use and allows you to export passwords into HTML, TXT, CSV, XML, XLS, DOC, RTF or PDF. 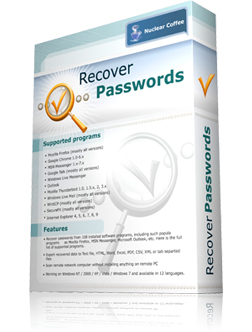 Nirsoft.net have a plethora of password recovery utilities for browser, mail prpgrams, messengers, windows protected storage etc. all for free, give them a look if you don't win a key here! Very cool program . Would be handy. I help some older folks keep their computers running well, as a favor to them and because it is a Christian thing to do. In my opinion it is too risky to run a recovery passwords program, either paid or free, in my computers. I only trust in Open Souce passwords recovery tools like Ophcrack. However, it is better to be in the safe side. That's why I create, store and backup all my passwords using an open source program like PasswordSafe.